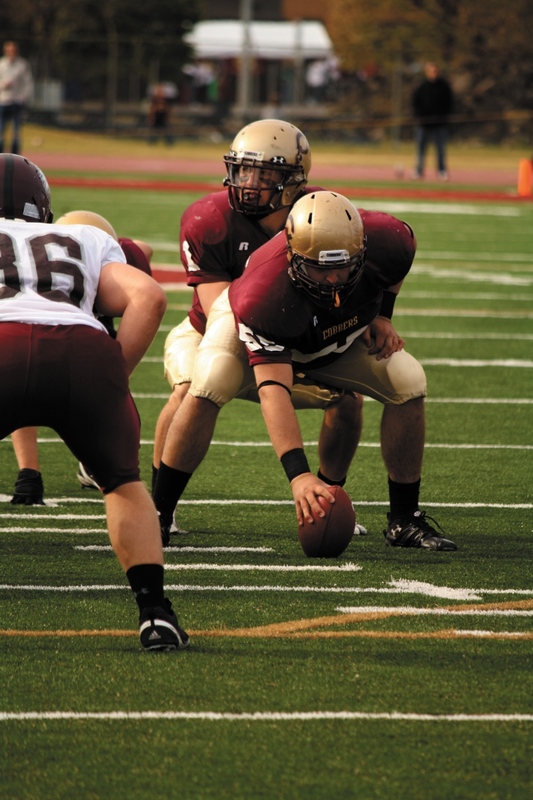 The Cobber football team’s season comes to a close this weekend in Northfield against St. Olaf. There will be a lot of “what ifs” looking back on this year for the team, but there are some positive things to build on for the future. There was a great deal of promise right from the first kickoff as the Cobbers started the season with two comprehensive victories against Dickinson State and Buena Vista. Last season was full of inconsistent play, but the standard for this season had been set. “I expected to compete for a MIAC championship and finish near the top of the conference,” Senior quarterback Michael Dunham said. Photo by Rachel Torgerson. Quarterback Michael Dunham leads a play against Bethel this past weekend. The Cobbers dropped their first two conference games for the second straight year to put themselves in a sizeable hole for the rest of the season. The team came up a yard short in their conference opener in overtime against St. John’s the weekend following the win at Buena Vista. No. 3-ranked St. Thomas then put up 509 yards of offense at Jake Christiansen Stadium to drop the Cobbers to 2-2 on the season. The team showed a lot of resiliency to comeback and live up to the expectations that Dunham had from the start. They went on to win four straight conference games and put themselves right back in the thick of the playoff race with a 4-2 conference record. Their postseason hopes hinged on another home game against Bethel. The Cobbers had compiled a 4-0 record in away games and hoped to improve on their 1-2 record in MIAC home games. The Cobbers jumped out to a 13-6 lead over No. 25 ranked Bethel at home, but the Royals scored the game’s next 21 points to put an end to any talk of playoffs. It leaves a lot to question. Things may have been different heading into the final weekend of conference games if the team could have converted the fourth and four against St. John’s and tied that game or if they could have put some points on the board in the last 44:45 of play against Bethel. The quality and talent was there and will be for next season as well. “I thought that the team played hard in every game, and we were able to compete and play right with some of the best teams in the country,” Dunham said of the team’s play this season. Dunham set the school record for passing yards this season, breaking the mark set at the end of the 1998 season. Though, he remained humble about his accomplishments. Head Coach Terry Horan had good things to say about his quarterback as well in a conversation with the Concordia SID. As the season winds down and eyes turn toward next season for the Cobbers, there are many good things going for the team. The defense in particular is returning a solid unit which leads the MIAC in sacks. The offense also has a lethal running back punch with Brett Baune and Trent Johnson headlining a ground game ranked second in the conference. At the close of his career, Dunham will look back at one thing the most fondly about his time at Concordia. The best part of football for him was “spending time and competing with my teammates.” There isn’t much else someone can ask for than that. The Cobbers close their season at St. Olaf on Saturday, Nov. 12 at 1 p.m.